Stream helps you build social networks with Django. Build, scale and personalize your news feeds and activity streams. Get started with building a personalized social network. Don't re-invent the wheel, use Stream for personalized feeds, social feeds and notification systems. 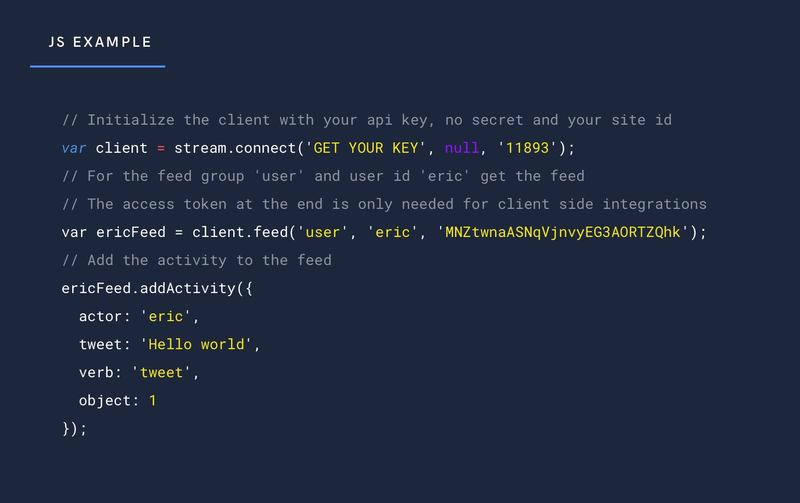 Developers can easily build personalization into their feeds with Django and Stream. If you want to include activity streams or a feed like twitter, instagram or facebook aggregated feed, Stream is the right solution for your app. Django is a Python based web framework that has been around for many years yet remains as popular as ever. It has stood up well to the test of time primarily thanks to its rich feature-set, quality documentation, and a resilient developer community. Django is proven as a fast, scalable and secure base for high-traffic social networks and feature-rich web applications. It was the framework of choice for extremely success sites like Disqus and Instagram. Django promotes a model-view-template architectural pattern. It includes a built-in and eponymously named template language which influenced many other frameworks. At the same time also supports popular alternatives, such as Jijna2. ReST and RPC style web APIs can be built directly on Django or the popular the Django Rest Framework extension (which we’re proud to sponsor). It was also one of the first web frameworks to include a robust ORM, migrations, and support for a wide range of SQL databases. Our framework integration for Django is stream-django. Our low level Python API is also available. mail_outlineContact us if you're using Django and want to be featured.